Best known for playing muse to Andy Warhol, Edie Sedgwick was a dazzling young socialite who found herself at the apex of the pop art scene in 1960s New York. In FACTORY GIRL, Sienna Miller is the enchanting, enigmatic Edie, offering a moving characterization of the extremely troubled model/actress. The film kicks off as Edie, the daughter of a well-to-do horse rancher, leaves art school and moves to Manhattan in the mid-'60s. Her friend Chuck Wein (Jimmy Fallon) introduces her to Andy Warhol (Guy Pearce), and Andy is immediately taken with the waifish, wealthy Edie. He welcomes her into his Factory, the silver aluminum-foil covered loft where an assortment of artists and oddballs assisted him with his projects. Edie quickly falls into the hard partying, drug-addled scene, starring in Andy's experimental films and becoming his constant companion. She becomes well-known for her unique style, and the fashion industry taps her as its very first "It" girl. Edie is flying high on Andy, speed, and stardom, when she happens to meet the Bob Dylan-esque "Folksinger" (Hayden Christensen). She falls in love with him, and in doing so, falls out of Andy's favor. Her drug addiction spirals out of control, her parents cut off her cash flow, and her very bright star seems to burn out almost as quickly as it rose. 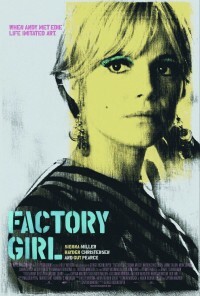 As with most biopics, people are sure to quibble over the accuracy of FACTORY GIRL, and whether it offers fair portrayals of so many larger-than-life cultural icons. However, viewers are sure to agree that it makes a poignant statement about the pitfalls of fame. When Warhol tells Edie's mother that her daughter is going to be "super famous", Mrs. Sedgwick coldly responds: "And what exactly would be the value of that?" Judging from the very tragic, short life of Edie, there wasn't much value in it at all.